At dawn on June 13, the 101st Airborne was about to attack the German line when it was attacked by tanks and assault guns. Two battalions of the 37th Panzergrenadier Regiment, supported by the 17th Panzer Battalion and III./FJR6, struck hard at the 501st PIR on the American left, which fell back under heavy pressure. The left flank companies (Dog and Fox Companies) of the 506th then gave way, and by noon the spearheads of the German attack were within 500 yards of Carentan. However, Company E of the 506th, commanded by 1st Lt. Richard D. Winters, anchored its right flank against a railroad embankment and held its position. Reinforced by the 2nd/502nd PIR taking position on its right, "Easy" Company slowed the German attack until American tanks could be brought up. Reacting to an ULTRA warning of the size and threat of the counterattack. Lieutenant General Bradley diverted CCA U.S. 2nd Armored Division (commanded by Brig. Gen. Maurice Rose and near Isigny) to Carentan at 10:30. At 14:00 CCA attacked, supported by the self-propelled howitzers of the 14th Armored Field Artillery Battalion. One task force of tanks and mechanized infantry surged down the road to Baupte in the 2nd/506th's area and shattered the main German thrust. A second task force drove back German forces along the Périers highway, inflicting heavy losses in men and equipment. 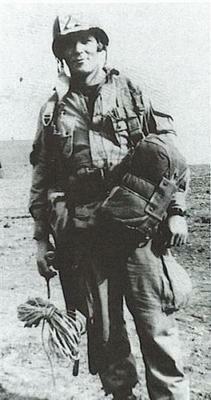 CCA, followed by the 502nd PIR, then pushed west a mile beyond the original lines. The counterattack became known anecdotally among the surviving paratroopers as the "Battle of Bloody Gulch".